Think about it. We all have doors—tall doors to closets or rooms, or smaller cabinet doors in kitchens or bathrooms. That’s a lot of surface area that can keep all sorts of items nearby, yet out of the way and organized. You may already have some hooks on your doors for coats or robes, or perhaps a shoe organizer for shoes or other items. But are you making full use of these valuable spaces? I love using the backs of doors for storage. It’s so convenient—I can quickly find and grab what I need. (It’s much easier than rummaging through a drawer or basket, for instance.) And it reduces visual clutter, which drives me crazy, by keeping items out of sight. I post a lot of my frequently referenced papers on the inside of upper-cabinet doors. Right above my phone is a list of emergency contacts. On another nearby door, I post schedules for sports and afterschool activities. (I’ve already entered the dates on my calendar—this is just for at-a-glance reference.) A different door has our town’s recycling schedule, as well as a chart for meat temperatures and a guide I clipped from a magazine about how to handle kitchen fires. By using these cabinet doors, I keep the outside of my refrigerator clear—no papers or magnets cluttering it up! Everyone in my family knows that when a kitchen staple is running low, it must be added to the whiteboard mounted inside a cabinet. This makes preparing my weekly shopping list so much easier. I also post my weekly menu here, to remind myself what to cook each night (and, sometimes, what to remove from the freezer the night before). I also often refer my kids to this menu when the inevitable what’s-for-dinner questions arise! I store a bottle brush and rubber gloves on hooks on the door under my sink. Next to the sink I have a hand towel on a hook. 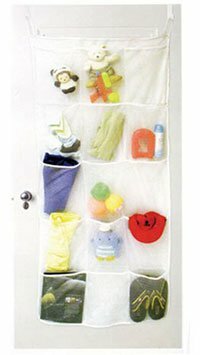 This system puts these items within easy reach, allows them to dry nicely, and keeps them out of sight—win win win! I hang oven mitts on a lower door next to my oven. On a different door I hang a grater and some strainers. I hang measuring cups and measuring spoons (all unnested) on an upper-cabinet door—one of my all-time favorite storage solutions. (Warning: If you do this, opening and closing that door can be loud! I put some strips of Velcro under the measuring cups to muffle the noise). Finally, on my pantry doors, I’ve attached small bins to hold bag clips and the lids to my plastic containers. In a bathroom cabinet, use an over-the-door rack for your blow dryer or flat iron. Cut down a shoe organizer for makeup or cleaning supplies. Hang a hook for a rag for daily touchups. Closet doors can hold hooks for robes, tomorrow’s outfit, or today’s clothes that you’re airing out. Or use shoe organizers for underwear or socks—or shoes. Or try a hanging organizer for your jewelry. The backs of bedroom doors are great for any of the closet items. Or in a kid’s room, how about a shoe organizer for toy cars or stuffed animals or craft supplies? Doors to your basement, utility room, coat closet, or garage are also great locations for hooks—for coats, perhaps, or your dog’s leash. Shoe organizers here would be great for shoes, as always, but also for tools, hats and gloves, sunscreen and bug spray, keys, or sunglasses. 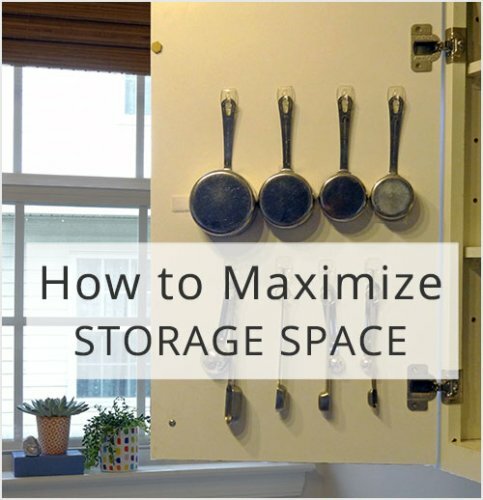 Are you using the backs of doors for storage and organizing? I’d love to hear how. Thanks Nancy, I have been rearranging things in my home, and I needed this to give me some new solutions for problem areas. That’s great to hear. I think these areas are easily overlooked, but they can definitely help when you are organizing (or reorganizing). Yes, I do use the inside of some doors as well. 1. Bedroom closet: shoe organizer (indeed used for shoes) on the inside of the door. 2. Bathroom, closet with stacked washer/dryer: 2 over the door hooks hold the hairdryer and a cleaning bottle on the inside of the narrow doors. 3. Small door covering our heating unit: a simple nail to hold 3 items we use only when we have a relative’s cat stay with us. 4. Pantry door: I taped the garbage pick-up schedule to the inside of the door together with an overview of how the pantry is organized. We also have an Ikea holder for plastic bags here. 5. Utility door located in a small entrance hall, the door is very narrow: we screwed a long narrow felt organizer to the inside of the door with some pockets and hooks. Here we store cotton shopping bags, emergency flashlight, bulky scarves, some fun pictures and DH’s camel-bag. 6. Kitchen cabinet under the sink: we screwed a smallish bin to the inside of the door holding our kitchen cleaning cloths. Wow, not only have you made good use of those spaces–but you’ve also been creative about it! I’ve begun using over the door storage racks to organize my home, but is there any way to disguise the hooks? I’ve been looking but haven’t found anything.